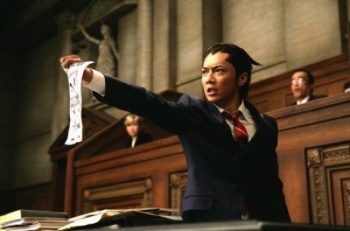 Takashi Miike, the celebrated Japanese director known for charming classics like Ichi the Killer and Audition, is bringing Phoenix Wright to the big screen. Actually, that's a bit misleading. There's more to Miike's portfolio than appallingly violent psycho-thrillers and terrifying Lynchian art films. He's also known for his crime dramas and black comedies. His big screen adaptation of Phoenix Wright: Ace Attorney, which we covered in the distant past, arrives in Japanese cinemas on February 11th next year, and judging by the promotional image to the immediate right - released today alongside a teaser site for the movie - he's certainly nailed the look of the titular defense attorney. There's certainly space for Miike's notoriously dark sense of humor in a Phoenix Wright film. When you get down to it, the games take place in some kind of dystopian nightmare-future where everyone has a bad pun for a name, due process has been scrapped and the courts will quite happily put people away for life based on the most trivial circumstantial evidence. Wright's profoundly cheerful attitude towards absolutely appalling murders is probably fertile ground for some grim chuckles, too. This isn't the first time Phoenix has made the jump to other media. In 2009 all-female stage troupe Takarazuka Revue performed a Phoenix Wright themed musical which, despite sounding madder than a box of ferrets, actually worked out quite well.